Whew, new winter season patterns, when we’ve only just had a few days of summer. Well, all the new season RTW collections are available at Style.com. And the fashion magazines are telling us the major trends (more on that planned). Meanwhile the pattern companies are supplying us with new wearable and current styles that fit in well with my recent themes. Especially classics for workwear. And I make some suggestions on co-ordinates. I’ve found myself making a lot of comments on simple pattern alterations. There are many patterns which show how easy it is to alter a basic shape to make different styles. Just by changing lengths and swapping style elements. Yes, some types of pattern making are complex. But making a different version of a basic is quite simple. A good month for thinking about this, as the ‘One Pattern Many Looks‘ contest is running at Pattern Review in July. The contest is limited as you’re only allowed to use one pattern view. One collar, sleeve, body shape combination, the same main pattern pieces throughout. For example you’re not allowed to draft facings for a new neckline (see my change necklines post). Length changes only if they don’t change the general type of garment, such as from a blouse to an evening dress. The aim is to make changes with fabrics, trims, and small style elements like pockets and tabs. I don’t think any of the versions in my post on what you can make from one pattern would be allowed in the PR contest ! By contrast I talk here about -all- the variations in one pattern. It’s worth looking carefully at any pattern with several views. They’re full of ideas for change. Many simple ways of ‘pattern making’ to get new styles which don’t involve challenging dart rotation, ’slash and spread’, or ‘pivot and slide’. More ‘classics for workwear’ with a bit of current interest. Soft blouses with several cup sizes, in Simplicity 2151 Amazing Fit. Take care with puffy sleeves in crisp fabrics if you’re a large cup size. A good range of choice for collars and sleeves. Notice all the collars work with the same neckline. And all the sleeves work with the same armhole. Three collars, three sleeves, with or without trim. Combining each collar with each sleeve gives 9 different versions. Make another set with added trim. So just the options shown give you 18 styles. Then add a short sleeve. Or use soft or crisp fabric, dark or light colours, plains/ solids or prints, satin or crepe. A lifetime of possibilities from one pattern ! If you wear layers, you’ll need a lower necked jacket to allow for/ reveal those blouse necklines. Perhaps the jackets in the first wardrobe pattern later. Or one of these jumper dresses for feeling cosier in winter offices, McCall’s 6396 (left) and McCall’s 6397 (right). Remember you need to allow up to 2 inches/5 cm extra underarm ease in a jacket, for each added layer you wear under it. Flirty flippy or sleek. All three styles in McCall’s 6402 are ‘street’, though the pleated style is currently mentioned most often by stylists. Those curved seams could give some apparent shape to hips that haven’t got any. Alternatively and unexpectedly, that hip drape gives a vertical line which can disguise wide hips. Though take care if you have a tummy – the vertical line of an overlay is good, but not the added bulk of that hanging drape ! If you look better with smooth over your hips, there’s Simplicity 2152. UK In Style magazine August issue says a pencil skirt is the look of the season. Longer and slimmer than those two choices. But YouLookFab goes for A-line and flowing. So take your pick ! What are the best length and shape for a skirt on you ? Are your body shape and proportions best in an a-line or a tapered skirt ? Do you prefer the ease of movement in an a-line ? 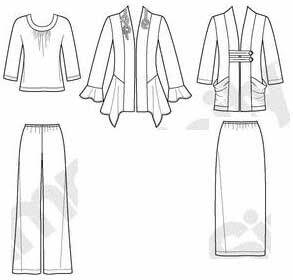 Make sure the skirt silhouette and inner design lines/ style seams work with the silhouette and inner lines of jackets you plan to wear it with. A wide choice of pant styles. UK Elle says this is a ‘trouser season’ : any shape from skinny to super-wide, worn with a blouse or ‘understated’ knit. There are full legs or straight in McCall’s 6403 (left). 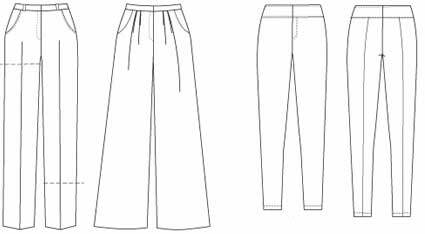 And very skinny pants in stretch wovens from Melissa Watson, in McCall’s 6405 (right). Super-wide is full over hips and down the leg. Not very practical as they need to be near floor length to look good. For most of us that means party wear rather than everyday. I don’t wear raglan styles on my sloping shoulders, so tend not to mention them, but here is a good fitted version with much potential, Simplicity 2149. Another example of how you can change a style by changing the elements. 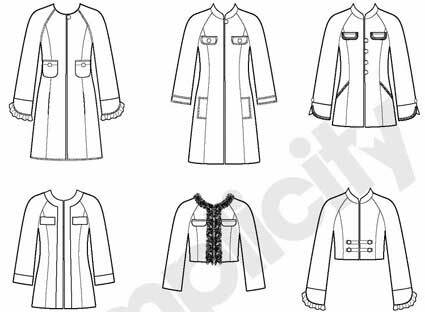 Look at length, collars, cuffs, pockets, trims, to see what big changes in character you can make with quite small pattern changes. No need to go to all the trouble of developing the fit of a new cut to get a different style. Three necklines, four cuffs, three upper pocket styles, three lower pocket styles, several trims and contrasts. More body conscious than a blazer. Pretty, classic, or edgy depending on colour, fabric and trim. 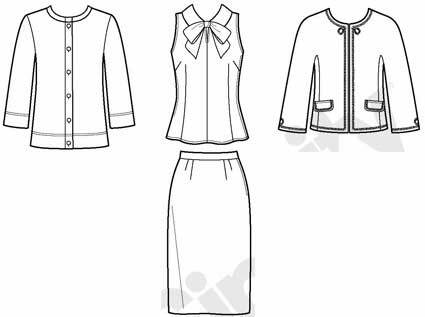 A jewel neckline on a jacket needs care with the choice of blouse. Wear a camisole or silky tee for a sleek look. 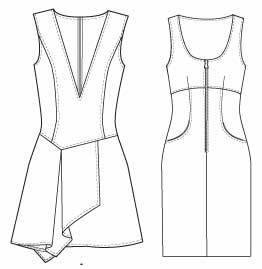 Use another jewel neckline, or mandarin collar. You may need to lower the jacket neckline by 1/8 – 1/4 inch / 0.5 cm to make room for a shirt collar or high bow (see the last wardrobe pattern below). In my opinion, skirt or pants to wear with this depends on length. The longer ‘jackets’ could be coat or dress, depending on fabric. These hip length jackets could look best with straight or slightly tapered skirt or pants. Or a skirt with many pleats. Even a skirt with a flounce from the same level as the jacket hem. Waist length goes with almost any lower silhouette. Micro or maxi. From skin tight to balloons, bubbles and tulips. Pleats, frills, and drapes. Simplicity are always good for wardrobe patterns in a wide variety of styles. This time there are some soft ones. Imogen Lamport’s ‘Business Casual‘ style is mainly knits. Simplicity 2148 is a wardrobe for knits. Look carefully and see the two very different jackets actually have the same upper body, sleeve, and neckline band. Imogen Lamport’s ‘Relaxed Business‘ style is drapey rather than tailored. Perhaps a cascade or revers jacket with slim pants or skirt, and some cowl or drape neck tops as well as soft blouses. Or if you feel your best wearing Jackie O ‘vintage’ style or ‘Chanel’ jackets, there’s Simplicity 2154. This entry was posted on July 2, 2011 at 8:11 am and is filed under current fashion, pattern making for clothes. You can subscribe via RSS 2.0 feed to this post's comments. Both comments and pings are currently closed. Autumn! I just getting out the summer clothes after a few hot days! Yes – it’s a bit ovewhelming isn’t it 😀 Well, we had some sun and warmth on Saturday, which has disappeared again. . .